The Washington Senators played in Griffith Stadium for 50 years (1911-1960). But only once, on August 8, 1931, did a Senators pitcher toss a no-hitter in the nation’s capital. The author of that gem was southpaw Bobby Burke, who fashioned a 38-46 record in parts of 10 seasons as a spot starter and reliever (1927-1935, 1937). Burke drew the attention of the Chicago White Sox, who signed the teenager soon after he completed school. Burke was sent to the Class-A Little Rock Travelers (Southern Association), where he was teammates with another 19-year-old future big leaguer, catcher Bill Dickey. Competing against players who averaged more than 10 years his senior, Burke held his own, posting the only winning record (11-8) for the last-place club (65-98), and logged 203 innings with a 5.54 ERA. Manager Joe Cantillon, who had skippered the Washington Senators for three seasons (1907-1909), probably thought he had a diamond in the rough. Based on scout Joe Engel’s recommendation, Washington selected Burke on October 1 in the Rule 5 draft. Washington’s pitching staff was in transition when spring training convened in Tampa in 1927, with their biggest squad ever assembled — 41 players, including 22 pitchers.3 The Senators had captured pennants in 1924 and 1925 propelled by a staff that had led the league in team ERA both seasons. But skipper Bucky Harris’s squad fell to fourth place in 1926, as age and injuries caught up to the staff and it finished a disappointing fifth in team ERA. The team’s longtime stalwart, 39-year-old Walter Johnson, was back for his 21st and final season in 1927, but was suffering from arm pain. 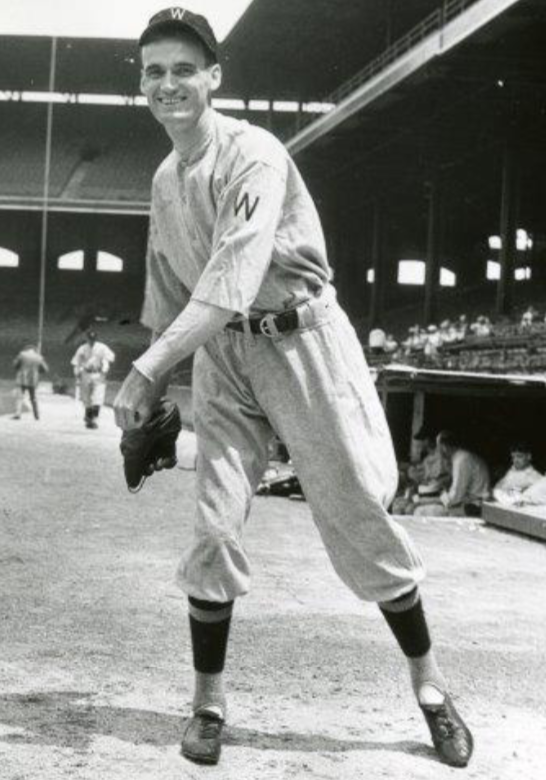 Dependable southpaw Dutch Ruether had been traded the previous August to the New York Yankees, and workhorse Stan Coveleski, a 37-year-old right-hander, was on his last legs and would be released in June. Some grizzled veterans like Tris Speaker, Sam Rice, and “Big Train” Johnson might have thought Burke was a batboy. The 20-year-old, baby-faced hurler stood an even 6 feet tall, but weighed just 138 pounds. He eventually packed on another 10-12 pounds over the next few seasons, but descriptions such as “skinny,” “string bean,” and “bean pole” would accompany him throughout his career. “I like the style of Bob Burke,” wrote umpire-turned-sportswriter Billy Evans. “He reminds you in action of Herb Pennock.”4 Despite the premature comparison to the Yankees’ formidable southpaw who had racked up 79 victories in the previous four seasons, Burke seemed to be in the right position at an opportune time. The Senators desperately needed a left-hander to join the only other veteran southpaw in camp, reliever Garland Braxton, acquired in the Ruether trade. Burke debuted on April 16, recording the final four outs, but also yielding two hits, a walk, and a run in an 8-7 loss to Philadelphia in the nation’s capital. Burke spent most of the season in the major’s busiest bullpen, joining Braxton and Firpo Marberry, who paced the league in appearances with 58 and 56 respectively. Burke emerged victorious in the first of his six starts among his 36 appearances, holding Philadelphia to eight hits and two runs in eight innings on July 2. “There’s no chance of a shortage of left-handed pitching talent,” wrote the AP’s Brian Bell about a group of at least eight southpaws at Washington’s spring training in 1928. Though Burke had an even 100 innings (and 3.96 ERA) under his belt, there was no guarantee that he would make the squad. Washington had re-acquired left-handed starter Tom Zachary the previous July from the St. Louis Browns and Braxton was primed to play a bigger role. Confined to mop-up duty on a crowded staff, Burke was loaned to the Birmingham Barons of the Southern Association in mid-May. “Ordinarily a pitcher wouldn’t be of very much use to a ball club if he was to pitch just four games and then pack his portmanteau,” opined sportswriter Harold C. Burr of the transaction. “The Barons are glad to get Burke on these terms.”5 Burke made a statement in his return to the big leagues a month later by tossing the first of his four career shutouts in what Les Conklin of the International News Service called a “brilliant 1-0 duel” with Red Ruffing of the Boston Red Sox at Fenway Park on June 22.6 Burke’s success, however, proved to be short-lived. After lasting just two thirds of an inning two starts later, he resumed his customary role as a mop-up artist with an occasional start, often in a doubleheader. The modest hurler finished with a 2-4 record and 3.90 ERA in 85⅓ innings while Washington dropped to 75-79, its first losing season since 1923. Walter Johnson, only a season removed from tossing the last of 5,914⅓ innings for the Senators, took over as skipper in 1929. Like his predecessor and typical for the era, Johnson employed his hurlers as starters and relievers, often going with the hot hand or playing match-ups. Eight pitchers started at least 10 games; first-year player Bump Hadley led the staff with 27. Seven pitchers logged at least 125 innings. Burke, a spot starter in the first three months of the season, enjoyed the busiest stretch in his big-league career, making 11 consecutive starts from July 17 to August 31. After Burke tossed complete games and yielded only five earned runs to win the first three of those, he was hailed by Washington sportswriter Paul E. Eaton as “having arrived.”7 Harold C. Burr noted that Burke, who now weighed about 150 pounds, seemed stronger. “He has learned to cut the corners and mix up his offerings,” wrote Burr. “[H]e has one of the easiest pitching motions in baseball.”8 But in an offensive era (the AL set a new league record for runs scored, averaging 10 per game), Burke was also hit hard during that stretch (5.40 ERA). While Washington’s franchise-record five-year stretch of first-division finishes ended with the club winding up in fifth place. Burke started a career-high 17 of 37 appearances, won six of 14 decisions, and owned a 4.79 ERA in 141 innings. Acknowledged as serious challengers to end Philadelphia’s two-year stranglehold on the AL pennant, Washington was once again led by what Les Conklin described as a “well-rounded mound staff capable of winning close to 100 games.”11 A septet of hurlers (Brown, Crowder, Marberry, Jones, Hadley, first-year southpaw Carl Fisher, and Burke) started 154 of the club’s 156 games, and logged 1,359⅓ of 1,394⅓ innings. In a precursor to what would happen later that season, Burke held the Detroit Tigers hitless into the seventh inning on June 3 in an eventual three-hit, 2-1 victory. Described as a “valuable asset” by D.C. sportswriter Denman Thompson, Burke won a career-high five straight decisions, in June.12 Saturday afternoon, August 8, seemed like an unlikely date for Burke to etch his name into the history books. According to Ronald Valentine of the AP, the hurler had severely burned his back the day before when he fell on an exhaust pipe while on a fishing boat.13 Overcoming the “depressing summer heat” and back pain, Burke became just the 20th major-league southpaw to toss a no-hitter, blanking the Boston Red Sox, yielding five walks in a 5-0 victory.14 Not only was Burke’s masterpiece the Senators’ first no-hitter since the Big Train’s gem at Fenway Park in 1920, it was the first and only no-hitter ever thrown in the 50-year history of Griffith Stadium (1911- 1960). Burke was bounced after retiring just four batters in his next outing, but returned two days later, on August 15, to toss 10 innings of seven-hit ball, yielding two runs in a 12-inning victory over the St. Louis Browns in Sportsman’s Park. After yielding 14 earned runs in only 12 innings in his last three starts, Burke pitched just once after September 7. He concluded the season with an 8-3 record, 13 starts among 30 appearances, and a 4.27 ERA in 128⅔ innings for the third-place Nationals, as the Senators were affectionately known. Burke was reinstated in the offseason, but his future with the club remained murky under first-year player-manager Joe Cronin. Coming off a dismal season (5.14 ERA in 91 innings), Burke was playing for his career. Thompson reported excitedly that Burke was “one of the most pleasant surprises” at Washington’s spring training in Biloxi, Mississippi.18 Once described as a “lobby sitter, his interests in the game negligible,” Burke seemed, according to Harold C. Burr, “refreshed,”19 while Thompson noted a different “attitude.”20 Unfortunately, Burke’s arm and shoulder pain returned by the end of camp. He was sent to Selma, Alabama, for medical treatment, and also trained with Chattanooga before returning to Washington for the start of the season. In limited action, Burke went 4-3 with a 3.23 ERA in 64 innings for the surprising pennant-winning Senators, who won a franchise-record 99 games. Burke did not pitch in Washington’s World Series loss to the New York Giants in five games. After winning 90 or more games for four consecutive seasons for the first and only time in club history (as of 2015), the Senators dropped to 66-86 and seventh place in 1934. The franchise would manage only four more winning seasons (and one .500 season) in the next 25 seasons in Washington before relocating to Minneapolis-St. Paul for the 1961 campaign. Burke, suffering from what The Sporting News reported as his “annual sore shoulder,” assumed his role as reliever and spot starter in 1934.21 In the second game of a doubleheader against Cleveland on August 17, Burke tossed a three-hitter to record his fourth and final shutout. That victory initiated the best stretch in Burke’s career. He completed five of seven starts and posted a 1.43 ERA in 63 innings, earning the designation of the “new Senators ace” by Theon Wright of the United Press.22 In what proved to be Burke’s most productive, but also final full season in the majors, the 27-year-old hurler split 16 decisions, made 15 starts in 37 appearances, and set career bests in innings (168) and ERA (3.21, fourth lowest in the AL). Described as a “perennial question mark” by UP, Burke began the 1935 campaign in the starting rotation, but was clobbered.23 He went 1-6 in eight starts and yielded 34 earned runs in 47 innings (6.51 ERA). “[He’s] lost his effectiveness,” opined Denman Thompson.24 The Associated Press reported in early July that Washington released Burke (1-8, 7.46 ERA in 66⅓ innings) to Chattanooga.25 But Burke refused to report, and was ultimately transferred to Albany in the Double-A International League. Burke posted a 12-16 record for cellar-dwelling Albany in the eight-team IL in 1936 and earned another shot at the big leagues despite his 4.65 ERA in 180 innings when the Albany club (which had acquired his rights from Washington) sold him on a conditional basis to the Philadelphia Phillies in the offseason.26 The Phillies had enjoyed just one winning season since trading pitcher Pete Alexander following a contract dispute with owner William Baker after the 1917 season, and were seemingly in perpetual need of pitchers. The 30-year-old Burke, “nursing a sore arm,” wasn’t the answer.27 After two relief appearances in which he failed to retire any of the four batters he faced, Burke was sent to Jersey City of the IL, where he made his last four appearances in Organized Baseball. Released by Jersey City, Burke signed with the St. Paul Saints of the Double-A American Association, but was released in spring training in 1938, bringing his professional baseball career to an end. “Ordinarily when a pitcher failed to win more games than I did,” said Burke in retirement, “he found himself back in the minors. But I was allowed to hang around, start a game occasionally, and wait for a relief assignment.” In parts of 10 big-league seasons, Burke won 38, lost 46, started 88 of 254 appearances, and carved out a 4.29 ERA in 918⅔ innings. His no-hitter against the Red Sox was the last thrown by a Washington pitcher in the nation’s capital until Jordan Zimmerman of the Washington Nationals no-hit the Miami Marlins on September 28, 2014. [The 1961 expansion Washington Senators, who replaced the relocated Senators to the Twin Cities in Minnesota, played one season in Griffith Stadium before moving into D.C. Stadium (later renamed Robert F. Kennedy Stadium). The second reincarnation of the Senators did not have a no-hitter until 1973 when Jim Bibby turned the trick two years after the club had moved to Texas]. According to John Jevitz of the Old Timers’ Baseball Association of Joliet, Burke was a “very quiet man and would fade into a crowd.”28 Shy and even withdrawn, Burke did not talk much about himself or his career in baseball. He attended the McGowan-Ormsby Umpire school in Florida in 1940, and umpired for one season in the Southeastern League. He served in the Navy during World War II, after which he returned to his childhood home in Joliet, and became active in coaching baseball in a local park district league. He later owned and operated Bob Burke’s Plainfield Fishing Resort. Burke eventually retired with his wife, Virginia (nee Greif), to Port St. Lucie, Florida. On February 8, 1971, Burke died at his home in Florida at the age of 64. According to his Florida death certificate, the causes were natural. He is buried St. Patrick’s cemetery in Joliet. In addition to the sources noted in this biography, the author also accessed Burke’s player file and player questionnaire from the National Baseball Hall of Fame, the Encyclopedia of Minor League Baseball, Retrosheet.org, Baseball-Reference.com, Bill Lee's The Baseball Necrology, the SABR Minor Leagues Database, accessed online at Baseball-Reference.com, The Sporting News archive via Paper of Record, and Ancestry.com. 1 Don Hazen, “Bob Burke: a Senator of old,” Joliet Herald-News, February 14, 1971. 2 The J. 1926. The Yearbook of Juliet Township High School. mocavo.com/The-J-Joliet-Township-High-and-Junior-College-1926-Volume-1926/902178/25#2. 3 Billy Evans, “Pitching Will Make or Break the Senators,” Alton (Illinois) Telegraph, March 29, 1927: 8. 5 Harold C. Burke, “Shirley Slated For a Comeback by Freak Trade,” Brooklyn Daily Eagle, June 7, 1928: 30. 6 Les Conklin (International News Service). “Youthful Browns May Be Successors to New York,” Huntington (Indiana) Herald, June 23, 1928: 6. 7 The Sporting News, August 1, 1929: 1. 8 Harold C. Burr, “Mack Blames Cover On Ball For Slugging,” Brooklyn Daily Eagle, August 10, 1929:6. 9 Thomas Holmes, “Johnson and Griffith Believe 1931 Senators A ‘Team of Destiny,’ ” Brooklyn Daily Eagle, November 26, 1930: 20. 10 The Sporting News, August 13, 1931: 1. 11 Les Conklin (International News Service). “Washington To Be Contenders For A.L. Flag,” Santa Ana (California) Register, January 27, 1931: 8. 12 The Sporting News, June 4, 1931:3. 13 Ronald Valentine (Associated Press), “No-Hit, No-Run Gem Pitched By Youngster,” Anniston (Alabama) Star, August 9, 1931: 12. 15 Associated Press, “Nats Troubled With Holdouts,” Post-Crescent (Appleton, Wisconsin), February 23, 1932: 13. 16 The Sporting News, August 18, 1932: 3. 17 Associated Press, “Charles Jamieson is Voluntarily Retired,” Lincoln (Nebraska) Evening Journal, August 19, 1932: 19. 18 The Sporting News, March 9, 1933: 2. 19 Harold C. Burr, “Detroit Boss Still Stands Behind Harris,” Brooklyn Daily Eagle, March 1, 1933: 19. 20 The Sporting News, March 9, 1933: 2. 21 The Sporting News, March 29, 1934: 6. 22 Theon Wright (United Press), “Joe Moore Ends Dean Indian Sign on Giants Batters To Win, 5-3,” Dunkirk (New York) Evening Observer, August 24, 1934: 10. 23 United Press, “Capital Fans Not Optimistic Over ’35 Team,” Ogden (Utah) Standard-Examiner, February 3, 1935: 11. 24 The Sporting News, June 13, 1935: 1. 25 Associated Press, “Nats Release Bob Burke,” Montana Butte Standard, July 12, 1935: 11. 26 The Sporting News, November 26, 1936: 5. 27 The Sporting News, April 8, 1937: 6.